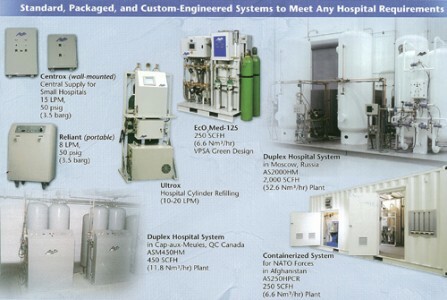 AirSep PSA Medical Oxygen Systems supply the needs of small health care facilities as well as large hospitals in more than 25 countries worldwide. Airsep PSA Medical Oxygen Systems enable health care facilities to produce their own oxygen on site – ending regular oxygen purchases. Average, as well as peak oxygen demand periods are easily supplied. Unsurpassed in accuracy, control and reliability, continuous on-line oxygen purity and pressure monitoring systems ensure an uninterrupted supply of medical grade oxygen. In the unlikely event the system deviates from preset limits, it immediately switches to the secondary oxygen supply. System alarms alert the health care facility of the condition so that corrective service can be performed. Engineering Excellence – AirSep engineers instrumental in early PSA oxygen research. AirSep leads current PSA technology development and refinement. Over 50 patents held worldwide. Energy-Efficient – World’s most energy efficient two-bed PSA oxygen process. Consumes as little as 2.0kWh per 100 cubic feet (.76kWh per cubic meter) of oxygen. Safe – Low pressure operation. Eliminates hazardous handling and storage of purchased liquid or high pressure oxygen. Substandard product or mislabelled cylinders are avoided. Reliable – Built for years of continuous, trouble-free operation. Eliminates irregular deliveries of purchased oxygen. Fully Automatic – Oxygen purity and pressure continuosly monitored. System switches to secondary oxygen supply in low purity or low pressure conditions. Easily serviced – Daily calibration and system checks performed in less than 15 minutes. Regular maintenance limited to normal air compressor upkeep and periodic replacement of oxygen generator filter element(s).